As we’re now heading to a big Christmas break at the end of the year, I would rather give you all the information that I’ve found which will give some useful suggestions for your trip to Asia. So far on the AsiaAcer blog, there have been recommendations on many travel destinations and top accommodations throughout Asia region which will be suited for every type of tourists such as top recommended Asian destination, the top beach resorts, the top adventure resorts, the top family resorts, the top spa resorts, top ecotourism hotels and so on. There are also the updates on the top ecotourism hotels I found recently. The list was released by one of the Asian hotel reservation companies – Agoda.com. This list will ensure that the green policies at these top-rated eco-friendly hotels go beyond simply encouraging guests to reuse their linen or take shorter showers. Hotels are given extra credit for reducing their carbon footprint, empowering local communities and implementing green policies specific to their locations. And I’m sure you will be proud of yourself when using their services as your little contribution to save this world. This resort near Chaweng Beach was pioneering sustainable policies long before the global trend caught on. When the resort’s late founder, Akorn Hoontrakul, designed the property in 1985 he ensured it accentuated the bay’s natural beauty without needing to fell a single tree. Akorn’s son now runs the property and continues his father’s legacy with the resort’s Green Project, a policy that outlines several initiatives including waste management, recycling and energy conservation. The Tongsai Bay works with the local community where it has built a low-carbon school and it is collaborating with other hotels on the island to ensure Koh Samui preserves its natural beauty for future generations. These two Alila Group eco resorts featured in Agoda’s Top 10 Eco-Friendly Asian Resorts for 2007. Alila Ubud was built in the style of an Indonesian hillside village while the Alila Manggis combines traditional Balinese architecture with contemporary design. Both resorts have policies to reduce their impact on the environment and each promotes Earth-friendly activities such as trekking, cycling and Balinese cooking lessons. The Sofitel Angkor Phokeethra Golf & Spa Resort is the only hotel in Cambodia to win an Asean Energy Award, which it received in 2005, 2007 and 2009. For more than five years, Accor – Sofitel’s parent company – has partnered with Agrisud International, an NGO which runs a number of poverty reduction programs in Seam Reap. Sofitel Angkor Phokeethra Golf & Spa Resort also buys produce from local farmers, sources locally made products and employs staff from nearby communities — many of whom are trained at the Paul Dubrule Hotel School in Seam Reap (Paul Dubrule is Accor’s co-founder). This resort, which has won several awards for its nature conservation activities, is passionate about protecting the local wilderness. Surrounded by forests and mangroves, El Nido Miniloc Island Resort minimizes its waste through recycling, operates an energy conservation policy and requires all staff to attend a five-day training seminar called ‘Be G.R.E.E.N.’ (Guard, Respect, Educate El Nido). The property also works with local organizations to conduct coastal clean-ups and monitor the Miniloc Island’s ecosystem. A database of local plants and animals is featured on its website. 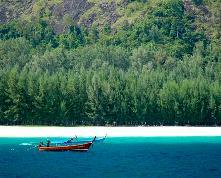 This secluded resort is located on a 400-meter stretch of sand on Pantai Tengah Beach, southwest of Langkawi. Its various green programs are integrated to streamline and minimize the environmental impact of its daily operations. The resort helps conserve the local environment by reducing its consumption of resources, minimizing energy use, only using environmentally-friendly detergents and cleaning waste water through wetlands – a natural biological filter. The architects who designed this property took special care to avoid cutting down trees. A conservation lab was built to preserve the surrounding rainforest, where trees are aged from 50 to 100 years and include some rare species. To reduce its impact upon the fragile environment, Banyan Tree Bintan supports a local village and helps preserve indigenous traditions by employing a network of more than 40 village craftspeople and connecting them with project partners throughout the region. Everything about this hotel says ‘luxury’, but in practice the Hotel de la Paix is an environmental workhorse. Its responsible tourism policy is realistic and sensitive to the local infrastructure and it sponsors many initiatives that benefit local communities, including a Sewing Training Center that provides skills training to disadvantaged Khmer women. The Hotel de la Paix’s sister hotel, Shinta Mani, runs the Shinta Mani Institute of Hospitality, an award-winning capacity building program that supports young Cambodians from high-risk areas. The hotel also offers guests the opportunity to sponsor students or donate bikes, wells and pigs to local families. The Orchid Hotel was Asia’s first property to receive ECOTEL® certification and it has won more than 61 awards since opening 11 years ago. It boasts an environment officer who leads its ‘green teams’, organic rubbish is disposed of in nine ‘vermiculture’ bins (worm farms) and an onsite water treatment facility recycles waste water. Guests have the option of pressing the ‘Green Button’ which increases the room’s temperature by 2C incrementally over a two-hour timeframe, reducing the air conditioning system’s power consumption. Coat hangers made from sawdust and herbal pesticides are other examples of the hotel’s sustainable policies. Sustainability isn’t a buzzword for the award-winning Soneva Fushi, which is on the Agoda green list for a second time – it’s wired into the resort’s DNA. Its list of green initiatives is both long and impressive and includes tree-planting projects, campaigns to ban shark fishing and a carbon offset program to buy a wind turbine in India. Soneva Fushi also has an in-house marine biologist to educate guests and ensure dive trips do not damage the local environment. One of its guiding principles is ‘Slow Life’, an approach which emphasizes ‘slow’ pursuits such as nature walks, star-gazing and non-motorized water sports. Situated on the Unseco World Heritage-listed Fraser Island, Kingfisher Bay Resort and Village is an eco-tourism veteran. Since opening in 1992, it has won several awards for its environmental practices, including the inaugural Steve Irwin Ecotourism Award. In partnership with the University of the Sunshine Coast, the resort runs a research and education center that closely monitors the island’s ecology, while guided eco tours cover everything from mangrove colonies to Aboriginal culture. Waste is sent to the worm farm where it is transformed into fertilizer and then used on the resort’s herb garden.